There’s still a year(ish) yet to go until Influx Press turn How the Light Gets In from a bunch of tiny stories to AN ACTUAL BOOK, but I’ve already had a lot of fun reading alongside other Influx authors at The Stoke Newington Literary Festival Late Night Salon and as part of SJ Fowler’s Mahu residency at the Hardy Tree Gallery. 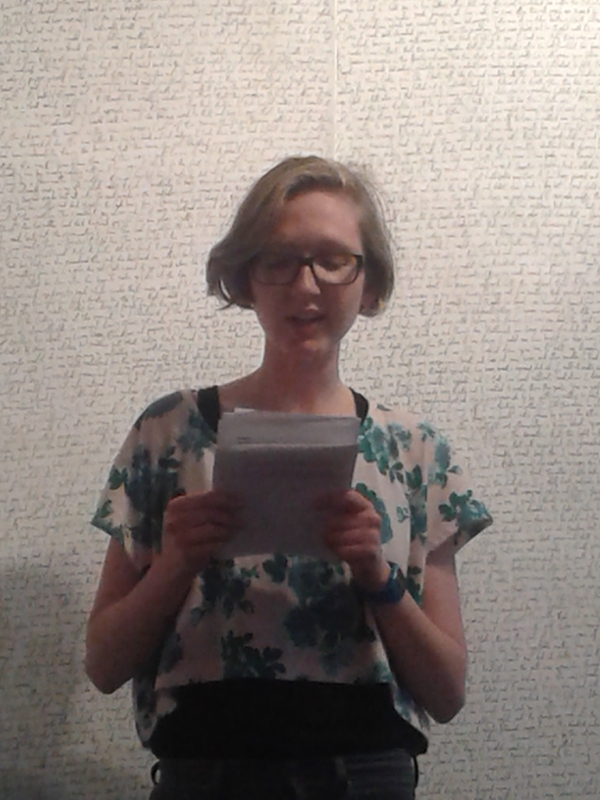 (NB the photo above was taken by my friend and writer-in-crime Rosa Campbell at the Hardy Tree Gallery and the rather snazzy wallpaper behind my rather messy hair is SJ Fowler’s exhibition of writing/ novel in progress. I’ve no idea what any of the words were but it was certainly beautiful). I also contributed to Influx’s Best Summer Reads blog, along with Gary Budden, Kit Caless, Eley Williams and Darran Anderson. You can read what we all think you should read here. It’s not a bit like those ‘ooh my best famous writer friend wrote this charming, pina colada laden tome’ summer reading list you’ll find in a broadsheet Sunday pull-out near you now; it’s darker and much, much weirder. What amazing success you’re having – best of luck to you with everything. Your success is wonderful to hear about. Even though I’ve only had some short stories published so far, I love hearing other peoples’ success stories – it shows hard work and talent can pay off. Best of luck with everything.